Synopsis: With the fireplace crackling, the tree twinkling, and the carols humming, few things in life are as picture perfect as Christmas in Maine—until murder dampens the holiday spirit. It must be something in the eggnog . . . Cozy up with a glass of eggnog and enjoy the spirit of murder and mystery in a Yultide treat perfect for those winter holidays . . .
My Review: This book has three stories in it that all have Eggnog as part of the plot. Eggnog Murder, Death by Eggnog, and Nogged Off. The books are based on the characters in the series that these ladies write, but you do not have to be familiar with them to enjoy these stories. 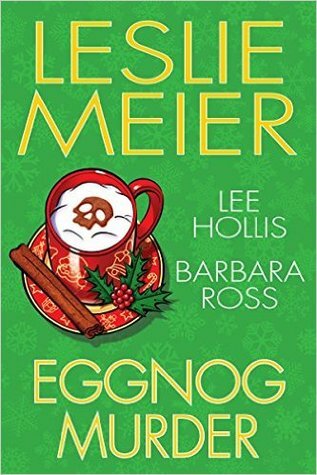 Eggnog Murder by Leslie Meier once again stars the sleuthing Lucy Stone. When one of the town’s busiest ladies gets poisoned by tainted eggnog, the fingers are pointing. Did it come from the “The Red Beard Santa Club”, or did someone else poison it? Was it poisoned at all? Who was the intended victim? While all this is going on, Lucy is writing a story about the death of a Veteran of Gulf Storm. Her sister’s story about how she was abandoned, left scrambling for funds and receiving no support from veteran affairs touched Lucy immensely. The story turns out to be misleading and Lucy is in trouble. Where does this all lead? How does it all fit together? Great plot with twists that will pull you in. This story was a case of a planned murder gone wrong. Of course, don’t forget to try the recipes included. Death by Eggnog by Lee Hollis stars food columnist Hayley. There is some similarity with the first story. Town librarian Agatha Farnsworth dies from anaphylactic shock after drinking eggnog with milk that was labeled non-dairy. She was a miserable woman who left behind a long string of possible suspects. I love that the library in town plays such an important role in the lives of the characters. This one took me completely by surprise. I had no idea who the culprit was. Again there are some fun recipes included in this story. I enjoy the characters in this series. Hayley’s brother and his husband are a hoot. The expressions the police chief uses, as his first language is Portuguese, are hilarious. The plot is great, but I did figure out the culprit in this one. Another fun read. Nogged Off by Barbara Ross is another fun one. The ditzy character that Julia brings home to Busman’s Harbor is Imogens Geinkes (initials I.M.A. Geinkes) and a jinx she is. Everything she gets involved in seems to go wrong. In this story she inadvertently poisons the staff with homemade Eggnog and they all end up in the hospital. Embarrassed so badly, she quits her job and can no longer take over the lease on Julia’s apartment. With no where to go, being dumped by her boyfriend, she somehow gets Julia to invite her to her mother’s home for a New England Christmas. Things do not go as planned. The truck with all her furniture is stolen from her mother’s driveway and then, Imogen’s boyfriend turns up dead tied to a chair in the back of the truck once it is located. I thought I had this one figured out, but with another twist, I realized I was on the wrong track. This was a good story that kept me guessing to the end. Recipes are included in this story as well. I enjoyed the holiday traditions shared in the book as well as the information that these are the ones the author participated in growing up. These stories really got me into the Christmas spirit. It was a great compilation of three very enjoyable cozy mystery writers. Check it out! The publisher generously provided me with a copy of the book via Netgalley.